I hate to think like that, but I believe you are ACCURATE here in what your pointing out. 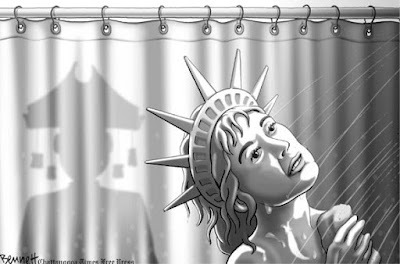 The thing about this GOP, is they got an inch and they took a mile, and they act quick when they do (too quick, without thinking), that stunt they pushed in Houston as far as using the bathrooms may end up spreading like cancer now across GOP America as example. Even though the social issues are of concern, what is even more troubling to me, is the economic viewpoint of the GOP and what they are pounding ... as you know, I spent 7 years here in Dallas working for a local republican politician in his printing business in Mesquite several years back (he was a cool guy too), I couldnt figure out why he was so gung- ho against electing Bush/ Cheney and asked him why at the time? ... he told me "Thomas ... every time we get a Republican President now, businesses start closing up here in Mesquite" (that was his opinion, and his prediction was right at the time). All of what you pointed out as far as the privatization things of Medicare, Social Security to even our public schools and the list goes on ... they want to attack, their list seem's endless at that! I wish that we were not in this situation Infidel ... to me the 2014 mis-term was a disaster I refer to as the "GOP Mudslde" was bad enough, when they got so much power in the Congress, that was even worse to me. Ranch: On right-wing sites the Houston ordinance is being presented entirely as a matter of weirdos invading bathrooms, not civil rights. Unfortunately it was mostly people who read that stuff who voted. Not sure I had a link about spare income in Dallas last time? "Mudslide" is a good term for it. And there are decades of data showing that the economy grows faster under Democratic Presidents. Ah, the eternal conundrum: best or best you can do? There are many (and this is much broader than US or any politics) of throwing good under the bus for the desire for ideal (whatever that may be). Infidel I think (and have done for years) that the biggest, best, change in US politics would be the rise of other parties. Obviously both the current ones are very broad. Perhaps too broad. It's hard to imagine a third party arising in the US -- the huge size of the country means that a vast amount of investment would be necessary to build something viable on a national scale, and any sensible advocate would conclude that that investment would be better put into winning influence in one of the two existing parties. I suppose it could happen if the Republican party finally splits in two along wingnut-vs-establishment lines -- but there are a lot of different flavors of wingnut. I doubt their half would be viable.